Who goes to Kennebunkport, Maine in the winter? No one…that’s who. Until now. 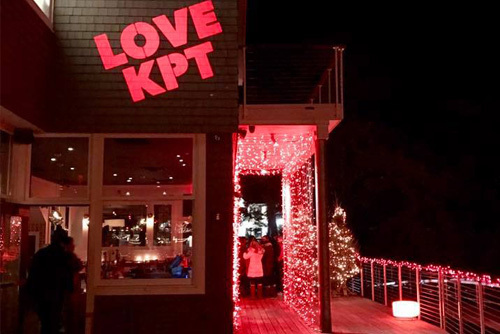 Flash back to 2015: To help our client Kennebunkport Resort Collection (KRC) bridge the revenue gap that plagues such a summer-season destination, we were instrumental in the creation of the Paint the Town Red program. Staking a claim as “New England’s Most Romantic Town,” Kennebunkport rolled out the red carpet of romance throughout the entire month of February…red twinkling lights all throughout town, Red Plate dining specials at all restaurants, Red Tag Sales at retailers, special surprises and décor at area businesses, and more. Year one (2015) was no small feat, as we had to help KRC rally local support for the program. This program would only work if area businesses would join together and participate to make the program bigger and stronger than just a KRC initiative. Redpoint took the lead on coordination and marketing…and we even contributed our painting skills to the effort, transforming dozens of everyday objects (even hockey sticks) into red ambassadors for the program. Year Three (2017) and Year Four (2018) have brought continued media (and revenue) love to KRC, with prominent pieces in The New York Times, The Huffington Post, Departures, and dozens more. With such high profile media proclaiming “This Maine Town Celebrates Valentine’s Day for the Entire Month of February,” and the addition of weekend pop-up dinners from KRC’s acclaimed summer-season Earth at Hidden Pond restaurant, all of KRC’s winter hotels buzz with life from late January through early March.